I seemed to do rustic ornaments on my tree when rustic wasn’t cool. One year I actually decorated my tree with old springs! My family thought I was crazy but when they saw the tree all finished they loved it. I am not one to ever do anything the same over again so I am always looking to make new types of rustic ornaments and I am in love with these dipped pinecone ornaments! 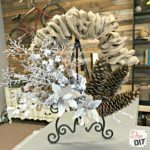 Update: I have gotten together with my some of my favorite bloggers and put together a group of other pinecone projects! They are linked up below! Enjoy! If you know anything about me, you know I am not very patient. The idea of waiting for paint to dry drives me crazy! So what is an impatient person to do if they want dipped pinecone ornaments on their Christmas tree? 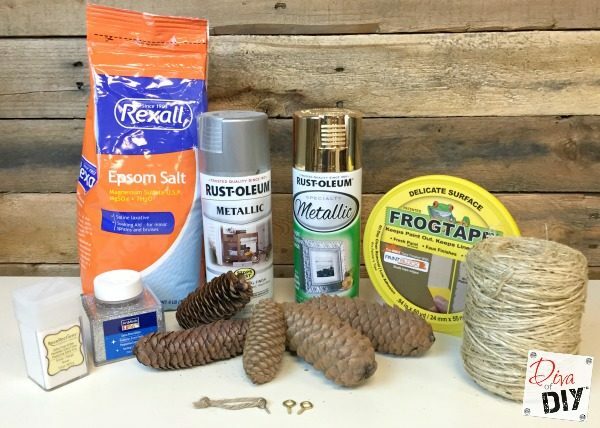 Make faux dipped pinecone ornaments with spray paint! It takes seconds to spray and minutes to dry! 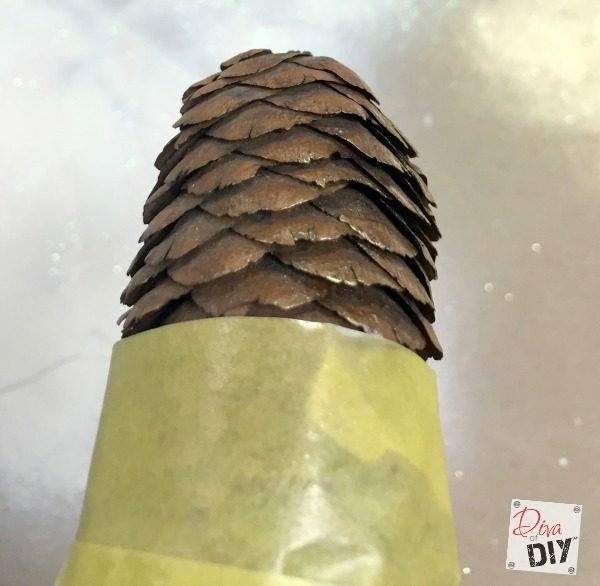 Step 1) Wrap the pinecone with delicate surface tape leaving 1/3 open. 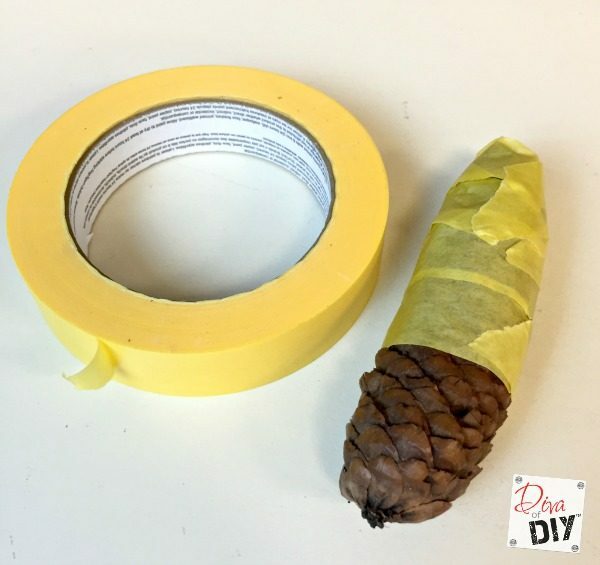 Step 2) Hold the pinecone on the tape away from you. Step 3) Spray paint the pinecone from the tape towards the end. Spraying it in that direction will keep the paint from seeping under the tape. 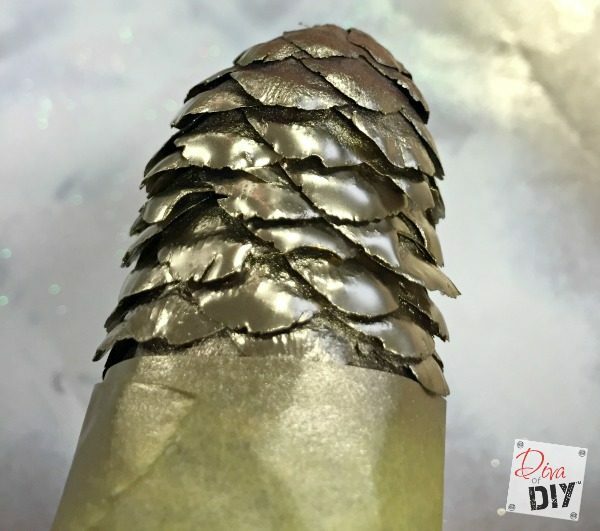 I love to mix metal colors so I painted some of my pinecones with metallic gold and others with a metallic rust color. The rust color was not enough of a difference in color for me so I decided to also glitter it. You can add glitter to any color or for a crystal snow look add epsom salts. Repeat steps 1-3 and then when adding glitter continue. 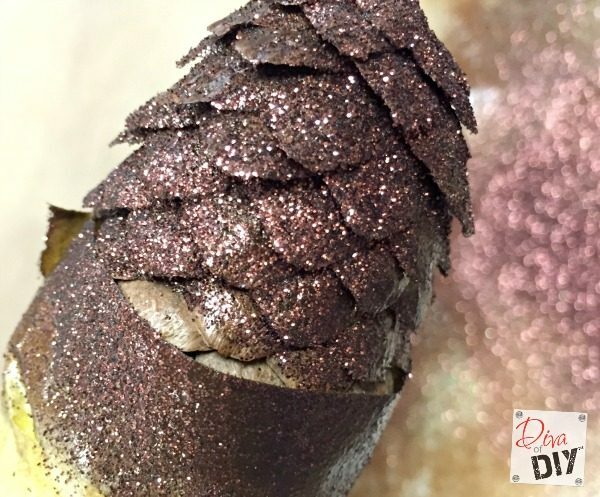 Step 4) While paint is still wet, sprinkle glitter onto the pinecone. Step 5) Allow spray paint to dry and remove the tape. Step 6) Insert an eye pin hook into the top of the pinecone. If the eye hook does not screw in easily you can start a small hole in the top with a small drill bit. 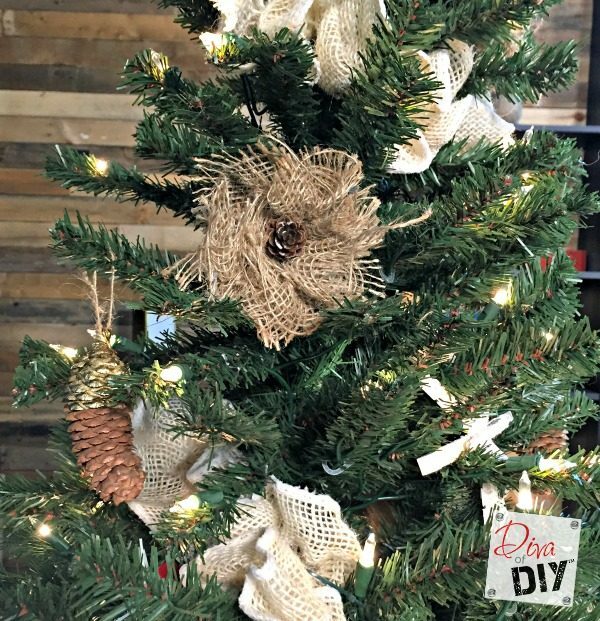 Step 7) Add jute twine to the eye hook to use as a hanger for your ornament. 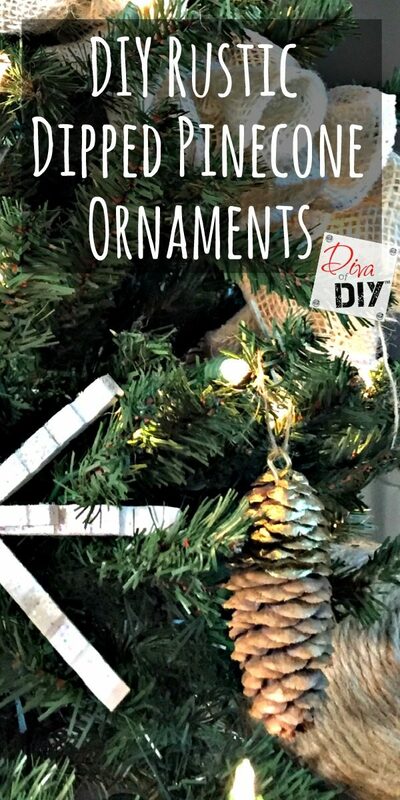 Now all that is left is to hang your rustic dipped pinecone ornaments on the tree. 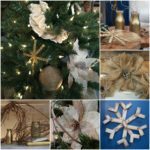 More pinecone projects from my blogger friends! 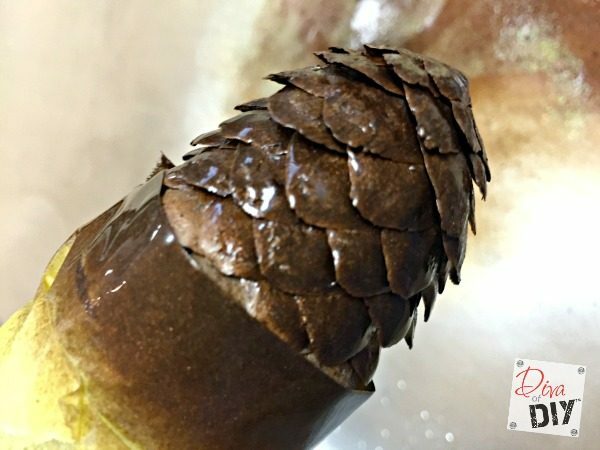 Ahh, I love the "dipped" look of you pinecone ornaments. They look great on the rustic tree. This gives me an idea for a Christmas gathering I'm going to in about a week. It would be a nice little gift for each of the ladies. Oh what a great gift! They will love it! Thanks for stopping by Toni! Smart girl. Sometimes spray painting is the way to go. I love the two tone look and the metallic rust finish with glitter. So pretty! Thanks Tonya! I am a rattle can girl all the way! 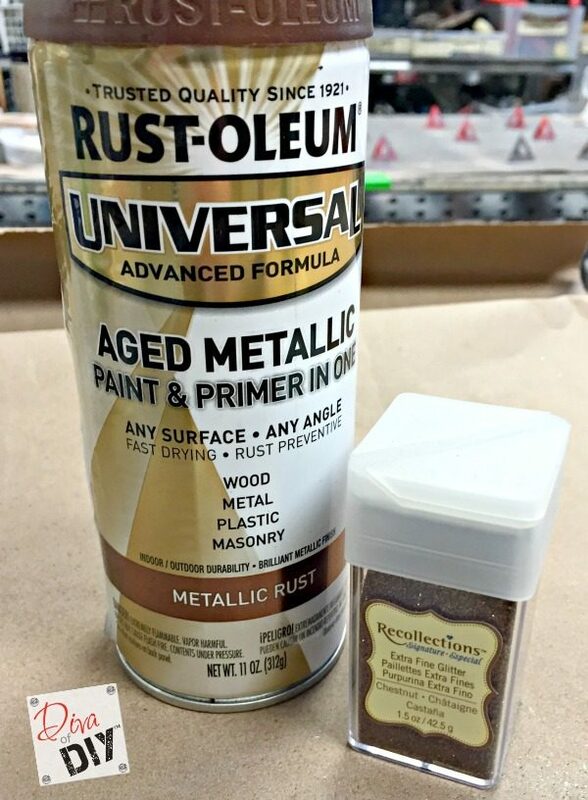 AKA Spray paint! 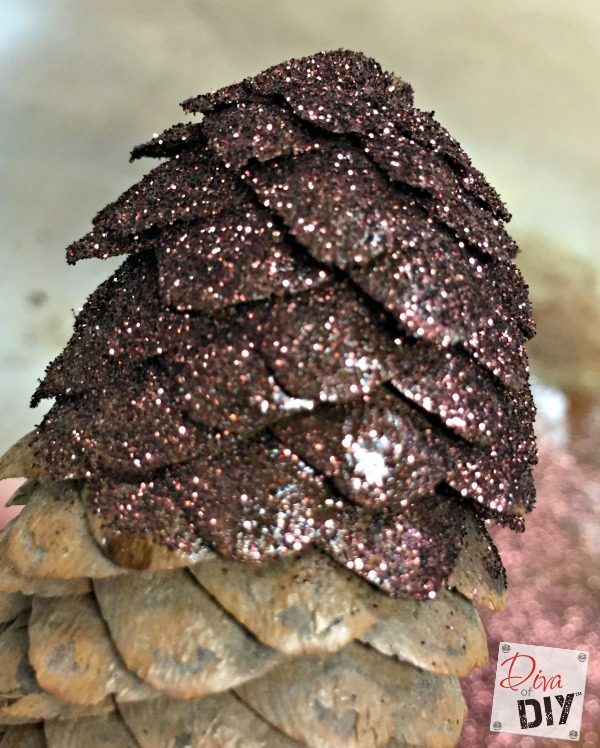 I love the rusty colored glittered pinecone...very subtle but full of bling! 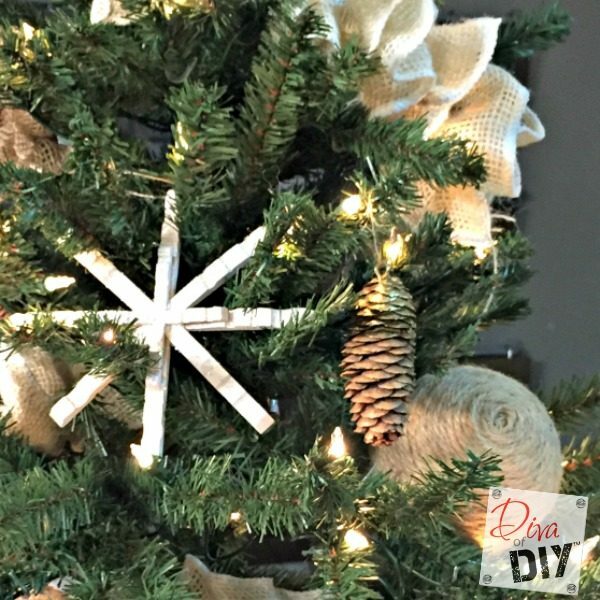 What a quick and easy project to make some rustic ornaments! I want to decorate some trees outside and this will be perfect! Thanks! I bet they will look great! Love this idea to bits! A fun project added to my list of things to make!